Comments: ***PLEASE NOTE*** This is the "Loose Leaf" Edition. Does not have a traditional binding like a hardcover or a paperback. Binder Not Included. Pages are slightly more worn from previous use. Regardless of title, CD/DVD/Access Codes or Supplemental Materials are not guaranteed. This book is not a rental. 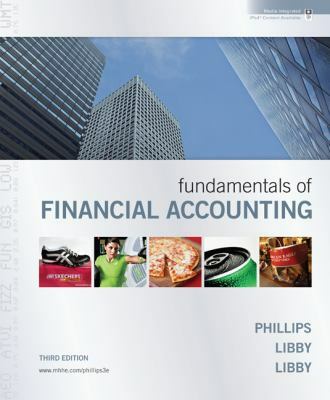 Phillips, Fred is the author of 'Loose-Leaf Fundaments of Financial Accounting' with ISBN 9780077405175 and ISBN 007740517X. Loading marketplace prices 20 copies from $8.70 How does the rental process work?